Welcome to our third Falliday Fest card drive of the challenge! Forgotten 4-Paws is a non-profit, 501(c)(3), volunteer-run organization concerned with the welfare of all animals. Though our main focus is animal welfare, we also rescue abandoned, neglected and stray cats and dogs, with the help of caring foster families (as we have no "shelter" of our own), and adopt them into loving, forever homes. To date, we have helped over 5,000 animals find the happily-ever-after endings they so desperately deserved. 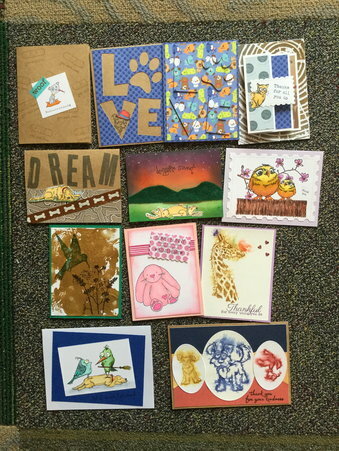 Requirements: For this card drive, you are asked to send thank you cards to send to those who have adopted animals, thinking of you, get well, and birthday cards to use for the volunteers, etc. They prefer cat and dog-related, but welcome any theme/design. Restrictions - blank inside, must include envelope. annsforte3, snietje and Kemernow like this post. Sending my three samples today!! So got one made so far for this one! I have three to send in today's mail! Woot, woot!!! I've seen lots of great cards in the gallery! Two doggy cards to send. Will plan to create more as I have great doggy stamps. Only got one made for this one, but got it mailed. I got these cards sent about 2 weeks ago now but didn't think to post here! I sent 8 cards for them. Here’s a dozen cards sending out today! Thanks for opportunity to contribute! Just took 4 cards and envelopes for this drive to the post office. I just love this cause. I hope to make more but did put a few cards in the mail. Oh my gosh! A challenge and charity close to my heart! 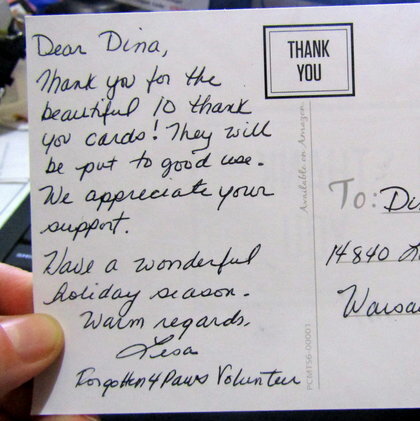 I only sent one card and I got a nice thank you from them! That was nice!